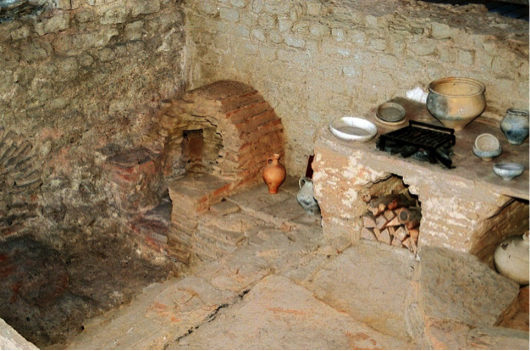 Making and preparing food has always been part of human life, but having a separate room dedicated to cooking is a relatively recent development in our history. Here at JMI Bathroom & Kitchens we love kitchens (obviously!) so we created this handy kitchen era guide on how the great British kitchen has evolved through the ages. From grandiose Tudor banquets to exciting Georgian spices and the lavish Victorian dinner party: read on & tell us what is your favourite kitchen era? At first food was cooked on an open fire. The fire was placed at the centre of a dwelling to allow heat to travel and smoke to dissipate through a hole cut into the roof. Some dishes would have been wrapped up and buried in the embers to cook. Early human houses were little more than single rooms where humans and animals all slept and ate together. Before the development of chimneys, humans had little choice but to put up with smoke and soot. 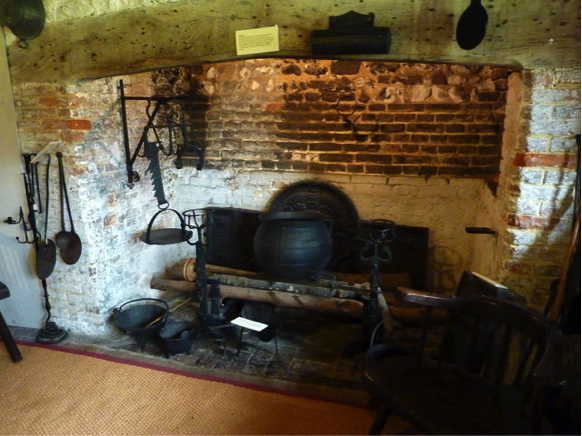 Eventually ventilation solutions and early chimneys allowed the hearth to be pushed back to either end of the room. People wanted to separate their living areas from the animals and the concept of different rooms started to evolve. People still preferred open areas for sleeping for safety and warmth, but having separate rooms became a sigh of wealth and prestige. Similarly in the Ancient world, poor Romans would have lived in one room, whereas wealthy Romans would have had a separate kitchen where their slave worked. Roman ovens were made of clay and built into the building. Ovens and chimneys were by no means universal in the medieval ages, but some rich households and monasteries could build state of the art kitchens with numerous fireplaces and ovens. These new kitchens were separated from the great hall for fire safety. For the poorer sort, making food continued on the open hearth much as before: meals often consisted of stews thickened with grains such as barley. Meat was scarce, and people had to bake their bread in communal ovens. 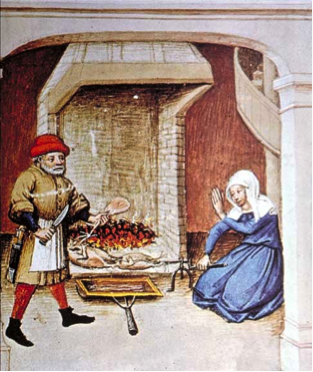 In larger kitchens, meat was roasted on a spit. Before the invention of rotating spits, kitchens would hire people to turn the spit in front of the roasting fire. A big part of medieval cooking was centred on preserving food for the winter: salting fish or pickling vegetables. Bread was also a big dietary staple and would have kept the kitchen busy. Food production was very much a local economy, and the kitchen would have been no stranger to slaughtering, hunting and growing their own food. Religious feast days and fasting also played a big part in medieval cooking, and meat was forbidden for much of the year. Monks who flouted these religious rules and ate rich foods were brought them under much criticism. Another huge part of kitchen life was brewing. Everyone drank ale, and it had to be continuously brewed in vast quantities. Cooks, even in monasteries, were satirised for their drunken antics in popular art and literature. The kitchen was much more than just a place to prepare food, it also acted as the household’s medicine cabinet. Using herbs from the kitchen garden to make various poultices and ointments was a big part of the medieval kitchen economy, a practice that continued long into the Tudor kitchen as well. The chimney was becoming a feature in richer Tudor households, though fire safety was still appalling by modern standards, and kitchen fires would continue to devastate (the Great Fire of London in 1666 was started by a sleepy baker). The opening up of international trade routes created a frenzy in Europe for expensive and exotic spices such as cloves and cinnamon. Food was increasingly becoming a status symbol, and Renaissance Europe’s royal families feasted and banqueted like their classical ancestors. Cooks were prized for their ability to create sensational feasts where food was shaped into mythic creatures, and live birds would fly out of pies. Even poorer families started experimenting with herbs and spices more. The kitchen was a woman’s realm, but it extended far beyond preparing food. In fact, Renaissance kitchens were small economies in their own right. Like the Victorian kitchens that followed, Tudor kitchens spread the space needed for cooking and food production over many rooms such as the buttery (for brewing), the spicery, the larder and the pantry. 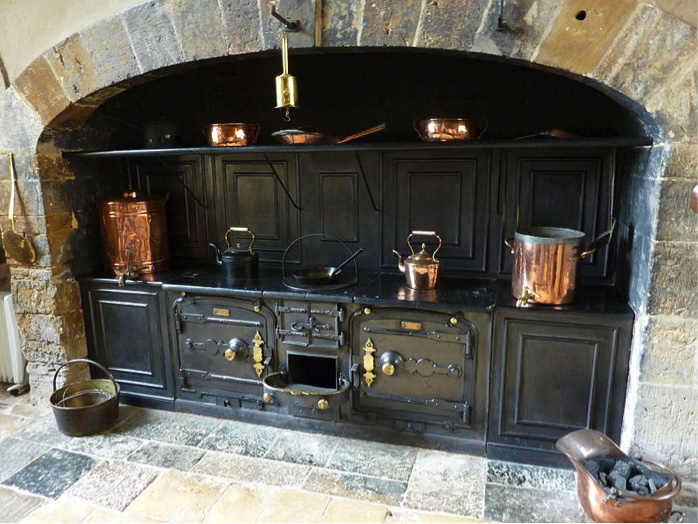 Brewing played a significant part in Tudor kitchens. One of the biggest changes was the gradual switch from firewood to coal in the later 17th century. This burned at higher temperatures and would lead to advancements in oven technology. European powers marvelled at the exotic produce that was flooding their markets through colonial trade. Places like salons and coffeehouses popularised the drinking of coffee, chocolate and tea. Exotic mixed drinks such as port or madeira became all the rage. Sugar, which came in huge cones, was liberally added to all food. Consumer society was starting to assert itself on the 1700s food market. But strangely enough, ‘common’ foodstuffs such as potatoes and tomatoes, only became popular for the first time in this era. Potatoes had been actually shunned as poisonous when they came over from the Americas. In Britain, technological inventions such as muslin cloths meant that puddings became popular, and many kitchen utensils were getting cheaper. The making of cheap moulds meant jellies were also popularised. The idea of simple British cooking, centred on dishes like roast beef was born in the Georgian era. Food was an arena where national identities and rivalries were worked out, and the French liked to satirise British cooking (and vice versa). In fact in France today you can still call a British person a ‘rosbif’ (a roast beef), an insult with origins in the Georgian era. There was still no technology to keep food cold for very long, though bigger Georgian houses did build separate ice houses, and smaller ice boxes were used in other houses. The use of cast iron standalone ovens, heated by coal, was probably the biggest technological advancement of the era. Like the Victorians, food and kitchens were becoming places increasingly influenced by middle class morality, and the smells and sights of the kitchen were being tucked away, far from polite society. Victorians and Edwardians ushered in a new era of separation between the kitchen and the rest of the home; larger house owners often building complex underground passages to separate food-making from food-eating. To keep food warm, complex heating arrangements were needed, or servants made to run fast with a hot tureen of soup! This separation between kitchen and diners was evidence of Victorian class anxiety. Only servants ate in the kitchen, and the master and mistress would not spend any time there. Even relatively small middleclass houses would hire a maid of all work to sleep and work in the kitchen, often hidden down in the basement. Though kitchen ranges made cooking food easier, water still had to be collected from wells or pumps so running a big kitchen required a lot of man (and woman) hours. The Victorians made the kitchen into a small industry, with set rules for each area. The kitchen became an extension of the household’s morality and cleanliness. The scullery, where washing up happened, was for the lowest class of maids: scullery maids. They had to spend their days scrubbing and peeling. Whereas the wine cellar and pantry were the butler’s domain, and he would get paid vast sums of money by his master and mistress to upkeep these areas. The most famous Victorian kitchen manual is the bestseller Mrs Beeton’s Book of Household Management (1861), which has given us an insight into Victorian food. The Victorians ate a lot of things we would avoid today, and favoured elaborate jellies and custards. French cuisine was becoming more popular; and larger households favoured long-sit down menus to show off their wealth. Poor Victorian families often had to make do with dishes like potato peels and boiled vegetables. The contrast in foodstuffs is evidence of a society that was struggling to come to terms with mass industrialisation. Malnutrition was prevalent among poorer people. Afternoon tea and the movement of people to cities made dining out or grabbing food on the go more popular; Victorian cities were full of street vendors hawking their wares. Oysters, then abundant on the English coast, were one of the most popular grab and go meals. The two world wars shaped the 20th century and its kitchens. The disintegration of class boundaries hugely impacted kitchens. Kitchens became smaller, designed around one person and design was all about ergonomics and practicality. Gone where the vast Victorian industrial kitchens- this was the dawn of the mod-con kitchen with running water and gas cookers. One of the biggest 20th century inventions was the fridge/freezer, which made food preservation much easier and safer. During the wars, food was a big part of war propaganda. Food was scarce, and the national focus was self-sufficiency and ‘making do’. The government rationed food and a lot of fresh produce such as eggs and milk, were powdered. People were encouraged to grow their own vegetables, going back to bygone days of the home-grown kitchen economy. Getting real coffee and chocolate, instead of substitutes, fuelled the food black market. Even after the wars, food was scarce for many people and fruits such as oranges considered exotic. Women were increasingly freed from the kitchen by labour-saving devices, though gadgets didn’t always mean freedom. 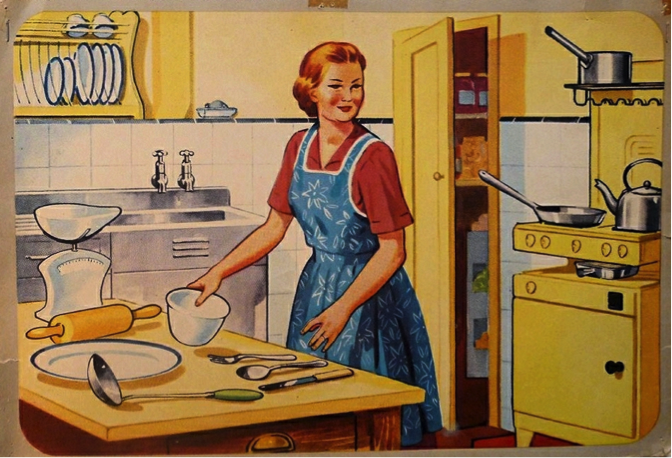 The 1950s was the heyday for domestic gadgets, but also ushered in a new era or repressive domestic roles for women. It was during the 1970s and 1980s that women began to truly free themselves from the role of running the kitchen. Nowadays, people often talk about the design rule of the golden triangle in kitchens. The focus is on a user friendly space, though rustic and nostalgic looks are also popular.